The city’s planning department has tapped a Boston-based consulting firm to oversee a “planning and engineering services” study on the proposed streetcar line in downtown. HDR, Inc., the same company that helped the city craft its original plans for the streetcar project several years ago, will be paid $1.7 million for the study. The Board of Contract and Supply and the U.S. Dept. of Housing and Urban Development (HUD) still need to approve the contract. Save the 1.7M and just listen to me. If the streetcar will be stuck in traffic and waiting for lights like the buses do now, then it will be a laughingstock. If the streetcar will operate in dedicated, un-bottlenecked lanes, then why the hell don’t we do that for the buses, like, yesterday? Speaking of HUD, I really hope the planning department considers putting affordable housing near streetcar stops (assuming they can do that). If the state is paying 1.7m, I believe they know what they’re doing, as well as the prestigious firm that is working on the project. In order for Providence to expand, they need to take advantage of an opportunity like this. Shall be very interesting. I believe the money is mostly from a previous (Federal) TIGER grant, but it is still a waste. Naturally the “prestigious” consultants are glad to pocket it, but the state would not pay, and the new RIDOT leadership doesn’t even mention it in their expansive 10 year “Rhode Works” plans. The public by and large thinks it is ridiculous and so do some of RIPTA’s leadership and the RIPTA Riders Alliance. A big question is, how many would actually be willing to pay $2 for a slow trip between the Providence RR Station and the Hospital District and points between, much of it already paralleled by bus routes that give way more options? Perhaps the streetcar idea does seem a little ridiculous right now. Will it seem ridiculous in a year or two when Providence is one of the hottest development prospects on the East Coast? When there could be (guessing conservatively) ten cranes in the sky in and around downtown? When the 195 land is no longer a wasteland? When the city is obviously growing and changing? With the exceptions of Buffalo’s underground light rail line and Dallas’ new badly designed streetcar route, where streetcar or light rail routes have been built in other American cities, real estate development and job creation has boomed. The most successful lines consider both transit and development opportunities. 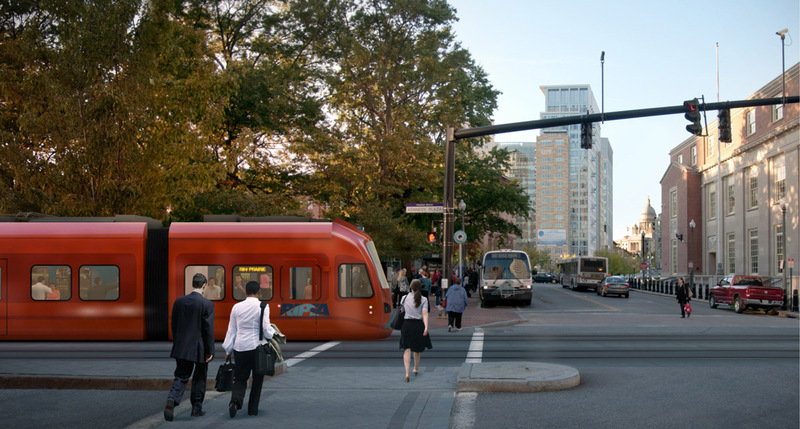 The Providence streetcar proposal should do more to address the transit side. A big weakness with the current proposal, especially from the Burnside Park to Empire Street as well as on Eddy Street south of Point Street, is the mixing of streetcars with car traffic. As much as possible, the proposed route should be designed to have exclusive right-of-ways, so that streetcars do not mix with car traffic to increase speed and reduce potential for delays. The route should be shifted from Washington Street and Kennedy Plaza to Exchange Terrace and Fountain and Sabin Streets where street widths could accommodate dedicated streetcar right-of-ways. It’s a bad idea for the streetcar to travel along Washington Street. The street is heavily traveled by RIPTA buses. The competition at stops and frequent headway times would likely negatively impact both bus and streetcar service. I would think once a streetcar route is built, they could eliminate or limit use for the bus route since the streetcar will be going that way, reducing traffic congestion. Also, couldn’t they put up proper signage/traffic lights to ease up traffic so it won’t be congested?